Contrast-enhanced CT of the neck and chest revealed a large right-sided peritonsillar abscess (Figure 1), thrombus along the anterior aspect of the right internal jugular vein (Figure 2), and multiple septic pulmonary emboli (Figure 3). Once properly diagnosed, treatment includes antibiotics tailored to susceptibility analyses and drainage of any loculated infectious fluid collections. Supportive care for respiratory or hemodynamic collapse is essential and intensive care monitoring is preferred. The use of anticoagulation in the treatment of jugular venous thrombosis is debated, since anticoagulation may actually propagate the infection. Only with prompt diagnosis and treatment may a full recovery be possible. The imaging modalities used to diagnose Lemierre’s syndrome vary based upon the clinical scenario. Ultrasound, CT, and magnetic resonance imaging (MRI) have all proven beneficial. 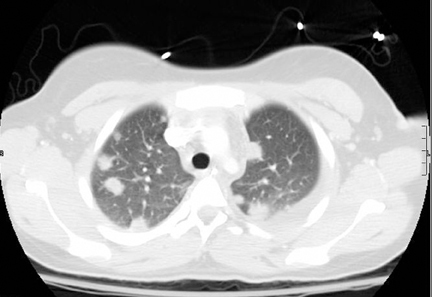 For the evaluation of septic pulmonary emboli, CT has proven to be the imaging modality of choice. With regard to internal jugular venous thrombosis, all 3 modalities have their advantages and limitations, however, ultrasound is often the initial imaging modality of choice due to its availability and lack of ionizing radiation.6 MRI also lacks ionizing radiation, however, sedation is often necessary to complete the study. 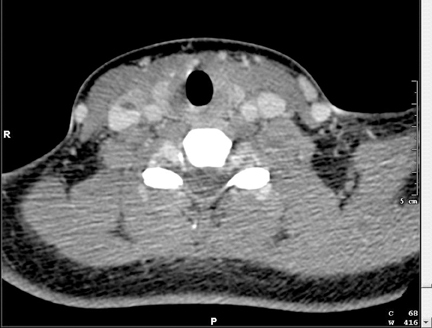 Contrast-enhanced CT is commonly used for evaluation of internal jugular venous thrombosis, especially when performed in conjunction with a chest CT to evaluate for septic pulmonary emboli. Lemierre’s syndrome is a rare and potentially lethal entity affecting otherwise healthy adolescents and young adults. 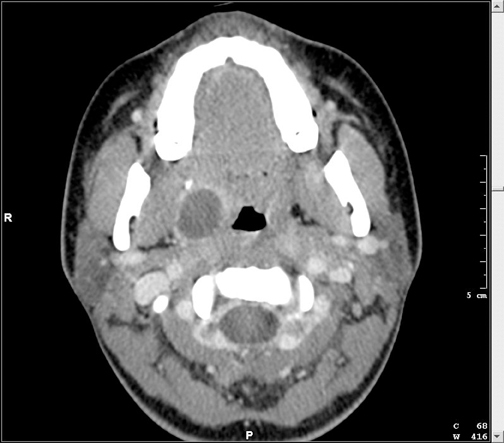 It consists of internal jugular venous thrombosis following a primary oropharyngeal infection with development of distant septic emboli, most often involving the lungs. Prompt diagnosis and treatment are necessary to prevent sepsis and subsequent death. Often, imaging findings precede clinical suspicion and blood culture results, therefore, the role of radiologists is crucial to the early recognition of this syndrome. 1. Sara Z, Beard G, Furey W. Insight into a forgotten disease: Lemierre’s syndrome. Resid Staff Physician. 2005;51:37-40. Riordan T, Wilson M. Lemierre’s syndrome: more than a historical curiosa. Postgrad Med J. 2004;23:241-245. Kristensen LH, Prag J. Human necrobacillus, with emphasis on Lemierre’s syndrome. Clin Infect Dis. 2000;31:524-532. Engelke C, Rummeny EJ, Marten K. A patient with prolonged fever after pharyngotonsillitis. Br J Radiol. 2004;77:627-628. Screaton NJ, Ravenel JG, Lehner PJ, et al. Lemierre syndrome: Forgotten but not extinct —report of four cases. Radiology. 1999;213:369-374. De Lima JE Jr, Levin M. Lemierre’s syndrome: Post-anginal septicemia. Pediatr Radiol. 2003;33:281-283.